The public sector employees as well as the parliamentary officials have accepted the new government, says the Co-Cabinet Spokesperson and State Minister of Mass Media and Digital Infrastructure Keheliya Rambukwella. He stated this addressing the post-Cabinet briefing held at the Department of Government Information yesterday (07). State Minister further said that the content of the letter issued by the former Minister of Law and Order Ranjith Madduma Bandara to the heads of state institutions does not contain any validity. 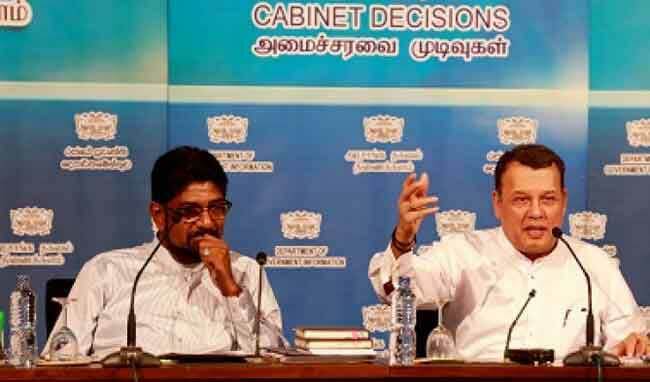 Addressing the post-Cabinet briefing, Co-Cabinet Spokesperson and Minister of Ports and Shipping Mahinda Samarasinghe stated that there has been no interruption for the functions of any of the ministries. Refusing to accept the letter, the Minister called for the former Minister to abstain from engaging in such disruptive acts. He further commented that letters of this sort send out a false message to the public sector employees, however, they cannot be influenced by such means. Co-Cabinet Spokesperson Mahinda Samarasinghe also called for the Speaker of Parliament to convene the parliament while abiding by the Constitution and rules and without looking at the situation from a political standpoint. He rejected the press release issued by the Speaker in this regard, claiming it to be invalid.